casa da musica is a concert hall that looks like an ufo that has just landed in rotunda da boavista. its surrounding travertine platform is pretty much the only smooth area for the hard-tried portuense skaters. porto is a city of many ups and downs and most streets are paved with very uncomfortable polished stones. the highly recognizable 17-facet structure was designed by pritzker prize winner rem koolhaas and it was part of the porto european culture capital, in 2001. still, it was only completed in 2005.
the location of the casa da musica marks the place where the old town ends and and the new town starts. the 100 million euro building includes a 1,3oo seat performance hall – the only one in the world with windows. that is because using glass surfaces usually messes up the room’s acoustics. this problem was solved by using two walls of rippled glass, a meter apart, for sound insulation. the building is conceived to be highly available to the public, music loving or not. beside the large auditorium, the 22,000 sqm also include a smaller, no fixed seating performance space, 10 rehearsal areas, recording studios, an educational area, a restaurant, a terrace, bars, a VIP room, administration areas, and an underground car park for 600 vehicles. there’s also a lot of spacial flexibility saved for eventual future alterations. a wide range of materials were used, from concrete, steel and aluminum to the more traditional azulejos, plywood and corrugated glass. 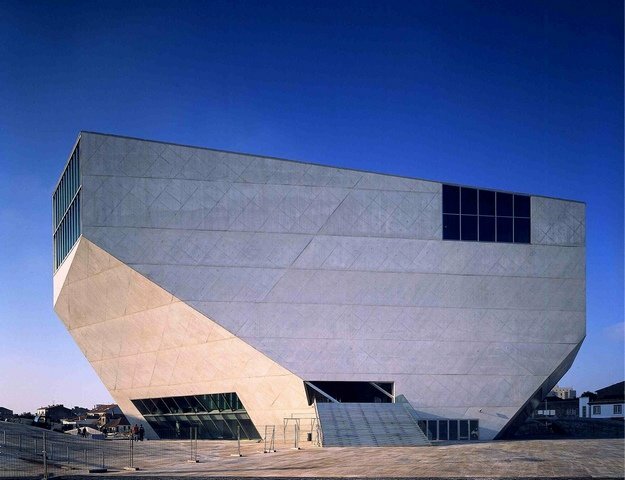 i love casa da musica and i love porto! i can’t wait to go back! Beautiful architecture! I would love to see it in person. One of my dreams is to travel the world visiting amazing architectural landmarks like that one!